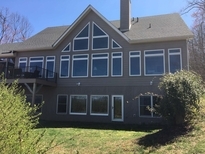 Call Mike Cowal at 919-724-5478-to tour Gateway Mountain and see gorgeous Luxury home for sale. Make your dreams come true. This luxurious custom built home is in the gated community called Gateway Mountain. Enjoy Lake George and Waterfall Park and hiking trails. Feel safe and secure in this community of nature lovers. Conveniently located close to Black Mountain, Asheville, Lake Lure and the Blue Ridge Parkway. Panoramic views from west of Mount Mitchell to east of Table Rock. Perfect for a private estate, a second home, and a vacation rental. Come fall in love with Gateway Mountain in Old Fort, NC. Call me now for a personal tour of Gateway Mountain to learn why these 3,000 acres are such a nature lovers' paradise.